A scheme delivered by Team Van Oord working on behalf of the Environment Agency has been named ‘Project of the Year’ in the prestigious 2016 Constructing Excellence in London and South East Awards. 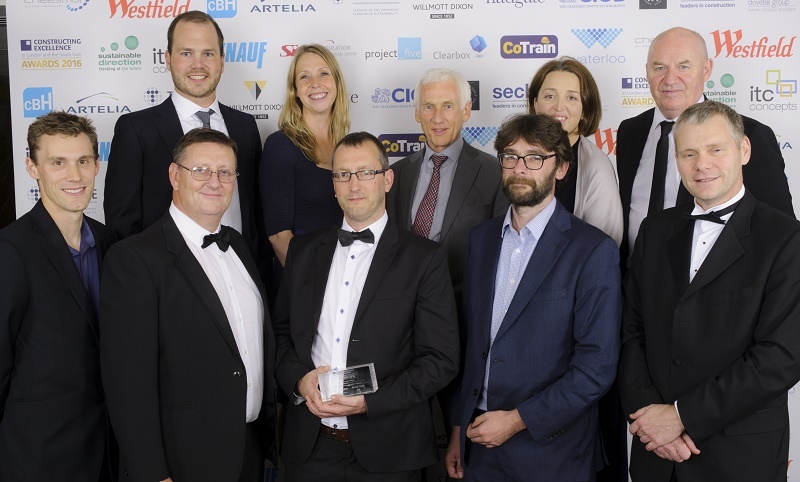 Having been named a finalist in two categories, The Broomhill Sands Coastal Defence Scheme went on to win ‘Project of the Year – Civils’ when the awards were presented in London on 30 June. The Constructing Excellence Awards recognise outstanding built environment companies and projects that have delivered improvements in all-round performance through collaborative working and a real desire to make a difference. The Constructing Excellence project of the year category rewards an outstanding project that “best demonstrates the highest levels of technical achievement, innovation, application of best practice, team working, delivered to time, budget and quality with the highest health amd safety standards, lowest environmental impact and most importantly to the customer’s delight”. Constructing Excellence Awards are held throughout England and Wales, and as a winner Broomhill Sands is now in contention for the National Constructing Excellence Awards held annually in the autumn. The works at Broomhill Sands extend across 2.5m of beach and include: a 1.8km length of rock revetment requiring 265,000 tonne of rock armour and a new concrete wave wall; recharging 700m of shingle beach and replacing the existing timber groynes; and widening and improving the existing access way along the top of the sea defences, including pedestrian access steps and ramps down to the beach. Roland Lloyd, chair of the Constructing Excellence Awards judging panel, said: “Broomhill Sands showcases outstanding effort from all members of the team to engage with the complex needs of the project and its diverse range of stakeholders. This is the third prestigious awards’ accolade bestowed on Broomhill Sands. Earlier this year it received the Innovation Award at the 2016 Environment Agency Project Excellence Awards. And last year the scheme was the recipient of the Environment Agency Exemplar Award which is presented annually to recognise outstanding health, safety and environmental performance in the delivery of its projects.